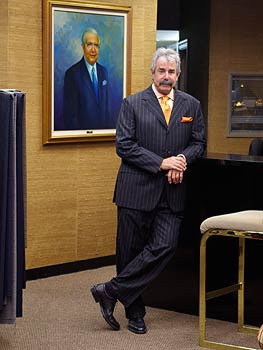 Michael Zell is the owner of Nathan's Custom Tailors in Richmond. Virginia Gentleman: Who was the first owner of Nathan’s? Michael Zell: That would be Nathan Zell, my Father. Virginia Gentleman: Nathan’s first opened in 1936, where was the first location? Virginia Gentleman: It was once the case that Virginia’s financial heart was Main Street in Richmond, but now the financial capital of Virginia may be Tyson’s Corner. How has Nathan’s changed to adapt to the changing market? Do more of your customers come from outside Richmond? Michael Zell: I consider myself to be a “destination” retailer…so all’s well with us and our very loyal clientele. Virginia Gentleman: It seems fewer men are wearing suits nowadays, has that hurt business? Michael Zell: It has impacted all clothiers, but we cater to men who have a strong interest in fine clothing with attention to the details of their appearance and “dressing trends” has little impact on them. Virginia Gentleman: I remember when Nathan’s was on Main Street. Where is the new location? Virginia Gentleman: It is hard for any business to last 70 years, what has been the key to Nathan’s success? Michael Zell: Great clothing and long term relationships with our clients. Virginia Gentleman: When I first started wearing suits, there were two choices, two-button, or double breasted. In the 90’s a three-button alternative started being offered. I think JFK made the two-button popular and Tony Blair made the Three-button popular. Was that just a phase or do men still go with the three-button option? Michael Zell: I sell all of what you’ve mentioned…everyone is different….to each his own.